Angel Francisco Fantauzzi Stella (1813-1891) was the first member of the Fantauzzi family to arrive in Puerto Rico from Morsiglia, Corsica after 1815, the year when the Royal Decree of Graces was approved by King Ferdinand VII of Spain allowing citizens of European countries other than Spain to settle in Puerto Rico. By the 1840s Angel Francisco was a successful merchant established in the port area of Arroyo. He eventually returned to Corsica where he died. In 1852, his nephews José (1832-1905), Cruciano (1825-1896), Francisco (1835-1924) and Gerónimo (1846-1906) Fantauzzi Stella arrived from Morsiglia and on 6/20/1853 organized the mercantile firm Fantauzzi Hnos. to purchase the business from their uncle. The establishmnet of the Fantauzzi Hnos. mercantile firm was the beginning of the road to the creation of Central Lafayette 52 years later. The Fantauzzi family was familiar with the sugar business as they owned a sugarcane refining business northeast of Paris in Coudum, France. José and Gerónimo returned to France in 1874 and 1878 respectively, the other brothers remained on the island developing the crop financing and sugar and molasses exporting businesses. Throughout the years, Fantauzzi Hnos. acquired several haciendas for non-payment of crop financing contracts. In 1862 they acquired one half of Hacienda Garonne in Maunabo from Rosalía Marcucci the widow of Juan Joubert, acquiring the other half in 1873 when Cruciano's wife Matilde Catalina Joubert Marcucci paid for 130,000 Francs to her deceased father's estate which included her sisters Maria, Emilia and Magdalena Joubert Marcucci and her mother Rosalía Marcucci. In 1857 they acquired the 800 acre Hacienda Felícita in Patillas from Francisco Agostini and the 99 acre Hacienda Emilia from Santiago Reyes and in 1858 the 50 acre Hacienda Palma in Arroyo from Concepción Altuna and her husband Francisco Monserrate Lopez. All these acquisitions became important contributions to the foundation of Central Columbia and Central Lafayette. Lafayette was the result of the consolidation of Haciendas Cuatro Calles, Ancones and Palma, being the 489 "cuerdas" Cuatro Calles the center of the new venture. 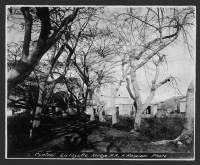 Hacienda Cuatro Calles was started in the mid 1800s by Luis Buenaventura Sanchez who died leaving the property subject to a $40,000 mortgage. It was acquired in 1871 by Arthur McCormick Fitzpatrick who in 1874 sold it to the mercantile firm William Lamb-Narsh & Co., owners in 1887 of Central Progreso in Carolina. Fantauzzi Hnos. leased and operated Cuatro Calles from 1886 to 1892 and acquired it in October 1893 when it was auctioned by the Government due to Lamb-Narsh & Co.'s insolvency. Starting in the 1880s the Fantauzzi's continuously updated the machinery in all of their haciendas including Cuatro Calles to keep up with the changing circumstances in part brought about by the abolition of slavery in 1873. These updates at one point in time elevated Cuatro Calles to a Central Sugar Factory, however, the exact date of the organization of Lafayette as a central sugar mill is unknown. It is 1905 when when the name "Central Lafayette de C & J Fantauzzi" begins to appear in legal documents. Before then, Cuatro Calles was mentioned in reference to Lafayette. Sucrs. 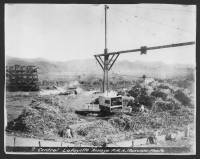 C & J Fantauzzi was organized after the death of Cruciano in 1896 and José in 1905 to engage in the agricultural, industrial and commercial business of Central Lafayette as well as of those of the haciendas Cuatro Calles, Palma, Felicita, La Vega, Garonne and the Columbia Sugar Mill in Maunabo. The February 3, 1912 edition of The Louisiana Planter and Sugar Manufacturer reports that "Central Lafayette, in the Guayama District, will soon be ready to grind...the proprietor, Don Antonio Fantauzzi, attends strictly to business during the crop, and afterwards usually returns to his home in Paris to enjoy a well-earned vacation, and he is to be congratulated for having one of the best centrals in Puerto Rico as a result of his application to business and perseverance. This is one of the few centrals which has not changed hands for many years, but has steadily been built up from a muscovado mill to an important central with a crop of about 80,000 bags." Sucrs. C & J Fantauzzi acquired Central Providencia in Patillas in 1929 after it was destroyed by Huricane San Felipe of 1928 mainly for its land and railroad lines. Though not a big sugar mill production wise with maximum annual production of about 40,000 tons, Lafayette was a pioneer in several ways. It reportedly had the largest crushing mill of all sugar mills on the island and was one of the first, if not the first, to have telephone and telegraph service. The first telegraph line in Puerto Rico was laid in Arroyo by Samuel B. Morse himself. Morse's oldest daughter, Susan Walker Morse (1821-1885), would often visit her uncle Charles Pickering Walker, who owned the Hacienda Concordia . During one of her visits, she met and married Edward Lind, a Danish merchant who worked in his brother-in-law's Hacienda Enriqueta . Lind purchased the Enriqueta from his sister when she became a widow and at the same time also acquired Concordia. Morse, who often visited at the hacienda with his daughter and son-in-law, set a two-mile telegraph line connecting his son-in-law's hacienda to their warehouse in the Arroyo port area. The line was inaugurated on March 1, 1859. The Fantauzzi's business savy motivated the sale of Lafayette at a time when it was generating substantial profits. In 1936 the Lafayette sugar factory and 10,000 acres were sold for a reported $3,815,000 to the Puerto Rico Reconstruction Administration (PRRA), the 1935 Puerto Rico branch of FDR's New Deal . Out of the 10,000 acres, the land not used for pasture was to be divided among former laborers and "colonos" into 314 farms mostly between 5 and 10 acres each. The mill was to be operated cooperatively by the Asociación Azucarera Cooperativa Lafayette that had been organized that same year. The cooperative was to pay back the PRRA $1.3 million investment over a 20 year period. In an effort to better utilize by-products, in 1938 the PRRA granted an administration loan to Asociación Azucarera Cooperativa Lafayette to build a plant for the manufacture of solvents from molasses, mainly butyl alcohol and acetone which plant was completed in 1939. El Mundo newspaper edition of November 29,1939 publishes an article informing that Miles H. Fairbanks, then Regional Administrator of the PRRA, appointed an independent committee to study the current and future affairs of the Asociación Azucarera Cooperativa Lafayette and if it had achieved the social and economic objectives it was intended to accomplish. Although the Asociación Azucarera Cooperativa Lafayette was a private legal entity, the PRRA had inherence in its affairs due to its finanacial investment in it. It is unbeknown to us at this time the recommendations made by the above mentioned committee and when and how the PRRA investment was paid off. The Asociación Azucarera Cooperativa Lafayette operated Central Lafayette until 1973 when it was acquired by the PR Land Authority never to operate again. The inscription on green building with the white columns states "Laboratorio Quimico", which indicates this was the sugar mill's laboratory. The residential structures pictured are near where the main structure is and date back to the sugar mill days. The book La Central Lafayette: Riqueza, Desarrollo y Politica en el Sureste de Puerto Rico by Gloria Tapia Rios includes a detailed history of the creation of Central Lafayette which name is said to refer to the address of the Fantauzzi's offices in Paris; 62 Rue Lafayette.